Remastered from the original analog stereo masters for the first time! Features performances by John Coltrane, Miles Davis, Bill Evans, Ben Webster and 27 more jazz greats! "This will make both your stereo and your heart sing. Some of the greatest jazz musicians of that or any era wailing and clearly having a Legrand time. Limited to 3000 copies. Don't miss it!" — Music = 10/11; Sound = 11/11 - Michael Fremer, AnalogPlanet.com. Read the whole review here. In 1958, a young, successful French composer-arranger with a major infatuation on American jazz, worked his way to New York and convinced the very best players of the time to record an album of largely jazz standards. Michel Legrand would go on to win numerous prizes and accolades (3 Oscars, 5 Grammies, 2 Palmes D'or, etc. 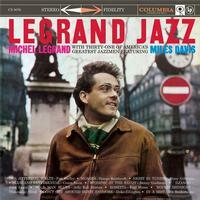 ), but little of what followed matched the sheer brilliance of Legrand Jazz. Miles Davis, John Coltrane, Bill Evans, Ben Webster, Phil Woods and practically every other session man in town signed up for sessions with Legrand to record his idiosyncratic arrangements of standards ("Django", "Don’t Get Around Much Anymore", "Night in Tunisia", etc.). Instead of regurgitating then-current bop styles, he reinvented the very nature of orchestral jazz band repertoire to make a unique and forward-looking statement on the genre. The sound of Impex's all-analog LP preserves the wide soundstage of late 50’s Columbia recordings while creating intimate spaces between players on the stage for maximum definition. This rare, highly-praised recording has never sounded as good as it does now. Go big with Legrand Jazz. Legrand Jazz was greeted by an enthusiastic review in the magazine Down Beat. Dom Cerulli awarded it five stars out of a possible five. The meticulously recreated outer jacket is packaged in a gatefold with an original photo montage inside honoring Michel Legrand's masterpiece of reinvention and sublime fan-boy enthusiasm.